July 30, 2018 -- Got milk? Or is that nut juice you're drinking? It depends on whom you ask. Dairy farmers say only milk from a cow can be labeled milk. Makers of nondairy beverages such as soy milk and almond milk say their labels make it clear what is in their product and they shouldn't have to remove the word milk. The debate has been around for years but has heated up in recent months. On Thursday, FDA Commissioner Scott Gottlieb announced the agency will focus on settling the question. It will look at how the current ''standard of identity" for milk is being interpreted. The FDA has hundreds of these standards, which define what a product must contain to carry a specific label, and it is now modernizing all the standards. The aim is to define how products have to be made. For instance: How many tomatoes do you need to call a product ketchup? One of those standards defines what a product needs to be called milk. "There is a reference somewhere in the standard of identity [for milk] to a lactating animal, and you know, an almond does not lactate," Gottlieb said last week at a Politico Pro Summit when he discussed the standard. At that meeting, he said the agency has ''probably not'' been enforcing the standard of identity -- and as a result, this nonenforcement has become the standard. To clear up the confusion, the agency is seeking comment as it modernizes this standard. In the statement, Gottlieb warned there could be health consequences if consumers are confused by labeling of nondairy milk. He cites a case report of a toddler who got rickets after being given soy milk, which does not contain bone-building vitamin D.
He expects to take comments for a year. "I do intend to enforce the standard of identity," he said. "Milk from farms has been around for much longer than soy or almond milk," says Brody Stapel, a dairy farmer who is president of the Edge Dairy Farmer Cooperative in Green Bay, WI. Soybean and almond milk products, he says, have ridden on the good reputation of milk. "Those beverages should be able to stand on their own and not piggyback on cow's milk for the sake of the name," he says. The current standard should hold, he says. "There is already enough customer and consumer confusion out there" about food labels, he says. "We're asking the FDA to enforce the laws on the books and call milk, milk," says Jamie Mara, a spokesman for the cooperative. Other products should not use the word milk on the label, he says. "If it comes from an almond, it should be called nut juice," he says. Makers of nondairy beverages say there is no confusion. 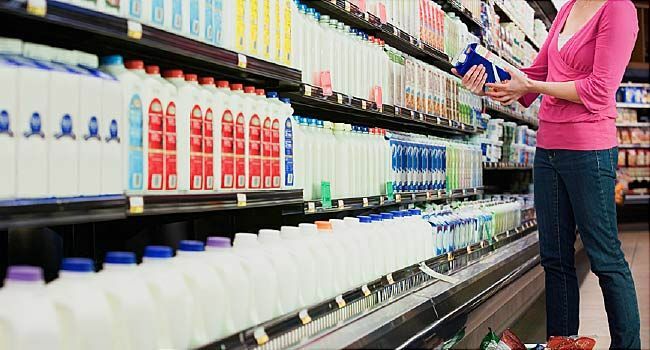 "When you are saying soy milk or almond milk, customers know what they are buying," says Jessica Almy, director of policy for the Good Food Institute, a nonprofit organization. It has asked the FDA to create a regulation for plant-based milk that would say compound names are acceptable as long as there is no consumer confusion. It's not about consumers picking one product over the other, she says. "The vast majority of people who drink plant-based milk also eat regular dairy." While consumers probably are not confused about soy milk being different from cow's milk, ''they are confused about the nutritional profile," says Erin Morse, chief clinical dietitian with UCLA Health in Los Angeles. Many people think nondairy milks have as much protein as cow's milk, and that's not always true, she says. "Coconut, oat, rice, and almond milk typically have zero to 1 gram of protein per cup," she says. "Milk has 8 grams. Soy milk has 8 grams." And so does pea protein milk, she says. Her other tips for those buying a plant-based milk: "Make sure it is fortified with calcium," providing about 30% of daily calcium needs. For vegans, it is important to look for B12 added to nondairy milks, she says. And watch out for extra sugar added to nondairy beverages. Especially, avoid products that list sugar as one of the first three ingredients, Morse says. Politico Pro Summit, July 17, 2018. Edge Dairy Farmer Cooperative news release, July 17, 2018. Jamie Mara, spokesman, Edge Dairy Farmer Cooperative, Green Bay, WI. Brody Stapel, dairy farmer and president, Edge Dairy Farmer Cooperative, Green Bay, WI. National Milk Producers Federation news release, July 17, 2018. Jessica Almy, director of policy, Good Food Institute, Washington, D.C.
Good Food Institute blog, July 23, 2018. Erin Morse, registered dietitian; chief clinical dietitian, UCLA Health, Los Angeles.